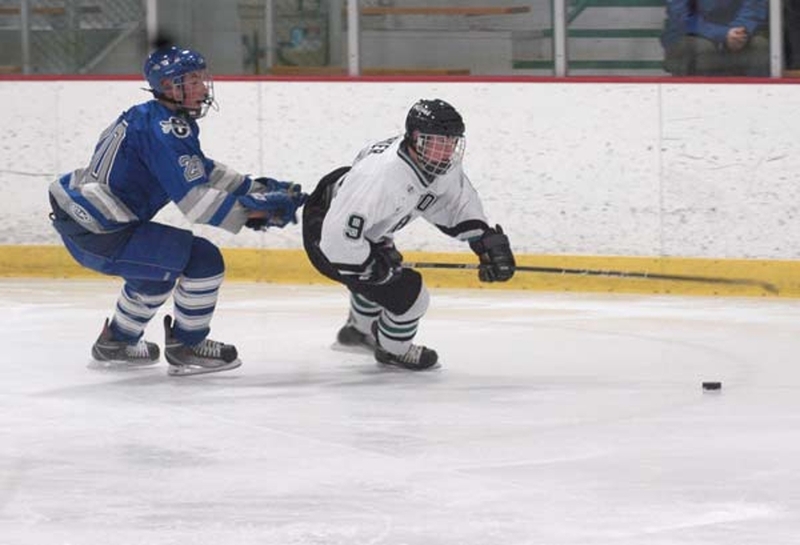 The formula for victory for the Faribault High School boys hockey team was simple Thursday against Owatonna. Score early and often and take the Huskies out of the game in the first period. The Falcons outscored Owatonna 5-0 in the opening frame and put it on cruise control after that in a 7-1 victory over the Huskies at the Faribault Ice Arena. Dan Mahoney led the Falcons with two goals while the Falcons also received single goals from Colbey Hullet, Ryan Dwyer, Garrett Gulsvig, George Richie and Bo Putrah. “(Mahoney) stepped up tonight,” Faribault coach Brad Ryan said. Hullett set the tone early for the Falcons when he scored the first goal of the contest just 1:23 into the first period. Mahoney then responded with two consecutive goals at 4:50 and 11:11 of the period to put FHS up 3-0. For the game, FHS out-shot Owatonna 33-18 with Faribault’s Aaron Forgaard stopping 17 shots in net. The lone power play goal of the game came at 14:41 of the first period when Dwyer sent home a shot after assists from Brandon Parker and Hullett.